As a child, my mother took us to one store and one store only for our shoes. The Stride Rite storefront sat right next to a Luby’s Cafeteria. The tradition held strong for many years: My sister and I would play with the toys in the store while my mother shopped and chatted with the salesman. Once the selection was made, we would wear our new shoes out of the store and proudly into the Luby’s for a family dinner. I’m following in my mothers footsteps and putting my girls in Surprize by Stride Rite shoes. 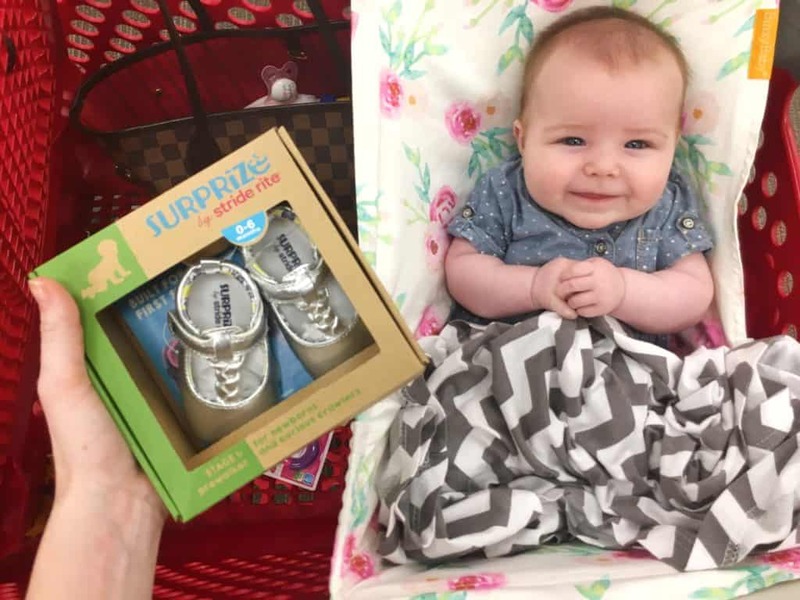 Now, instead of a storefront and Luby’s, were shopping for them in the Infant Section of Target with our Starbucks drink in hand! I love that we can pick these up at a store that we already frequent so often. It really doesn’t get any better than that! I really see why my mother chose Stride Rite all those years ago. I quickly learned that not all shoes were created equally when it comes to little feet. They need something different for just about every stage. What works for a crawling baby definitely will not work for a wobbly, brand new walker. 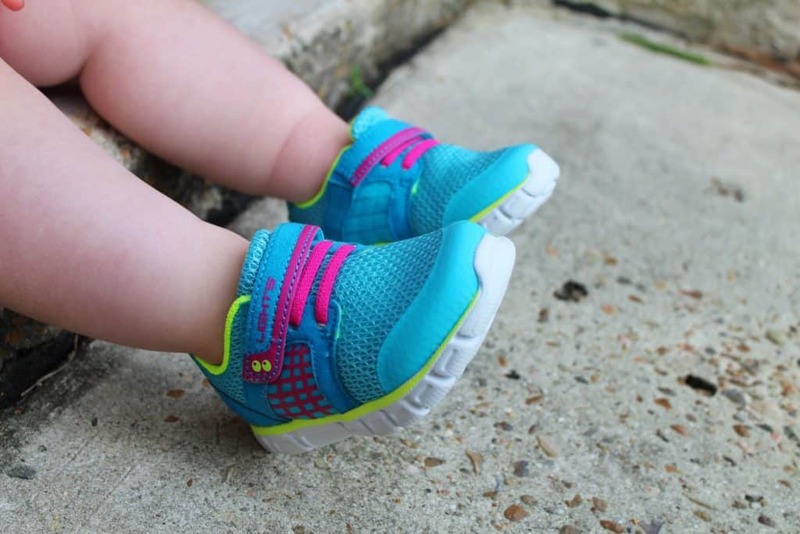 Plus, with how quickly a baby’s foot grows, it’s important to put them in a shoe that offers them the comfort and support they need for healthy foot development. These are all of the reasons I love the Surprize by Stride Rite brand. 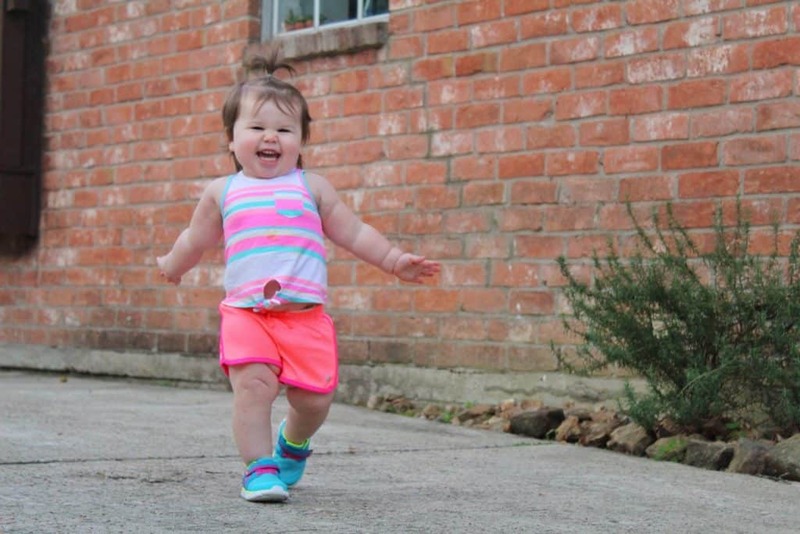 The Surprize by Stride Rite line has 3 different stages of shoes: Prewalker, First Walker and Off and Running. They have a TON of style varieties for both boys and girls. They have fun, weekend type shoes, sneakers and even dressier shoes for special occasions. Obviously, Emmy is the “off and running” stage. With all the running and climbing she is doing, she really does need added structure and support. The Surprize shoes have a memory foam sole that is giving her exactly what she needs in terms of support. She’s running and climbing on just about every kind of surface these days and really needs a firm but comfortable shoe. Added bonus- they also have an anti-stink lining, something any mom can appreciate, especially with the summer heat we have coming! Emmy has also become very independent over the past few weeks so I can’t talk about these shoes without adding how much she loves being able to Velcro them herself! 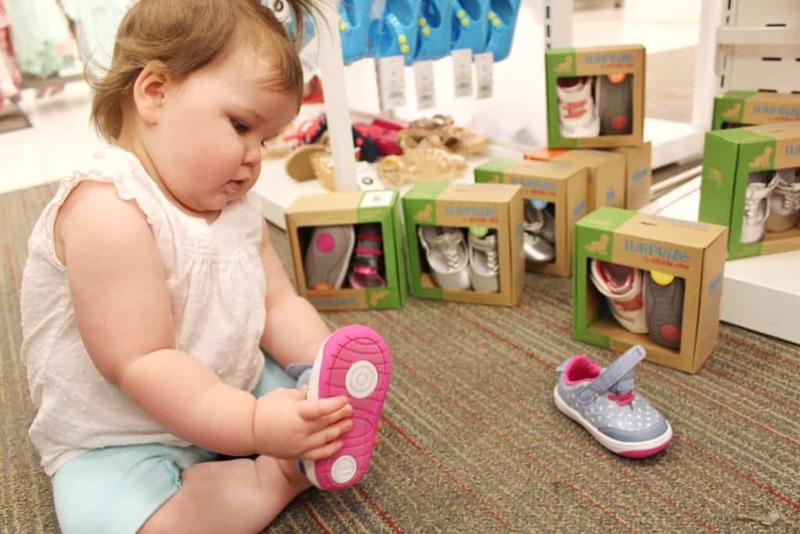 We picked up a pair of Surprize by Stride Rite shoes for Nora as well! She was obviously in the prewalker stage. These are also made with the memory foam bottoms but are much more flexible for the natural movements little ones her age make. They also have a rounded toe to improve balance for those first steps. 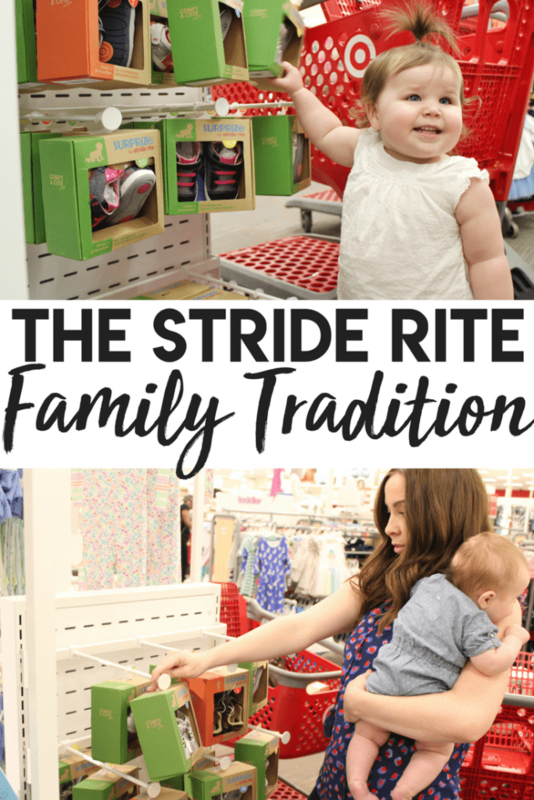 If you are searching for shoes for your little one, I would highly recommend the Surprize by Stride Rite lie, no matter what stage your little one is at! 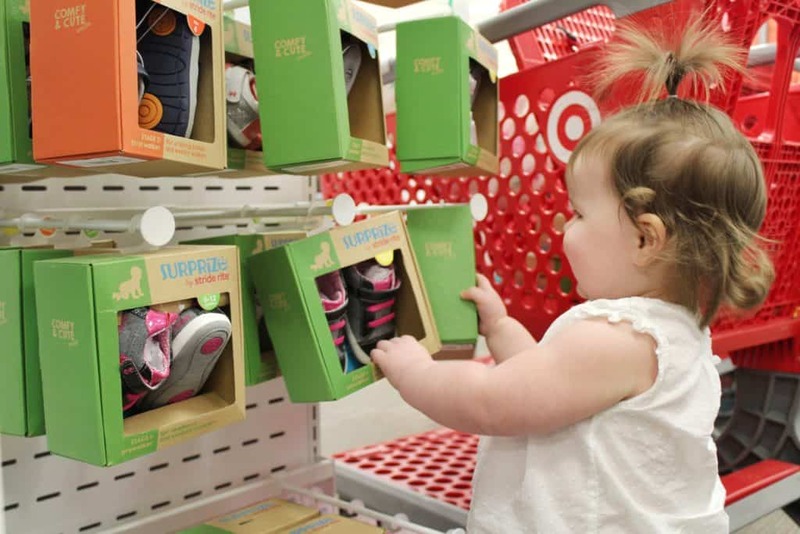 Surprize by Stride Rite shoes are available at Target, both online and in-store in the Infant section.